Story: After handing him the Qirin's horn, Mr. Kato pleads for another request. He needs the tough shell of the Kappa appears at the same lake where the Qirin resides. Only, Kappa would rise to the surface an hour before the sun rises, and get back to the deepest part of the lake once the sun has shown it's first ray. The Kappa isn't as swift as the Qirin but its defense rivals that of a tough (C-Ranked) shield. It attacks with its claws and gets inside its shell to defend itself from attacks. Kill the Kappa and hand its shell to Mr. Kato to get your reward. 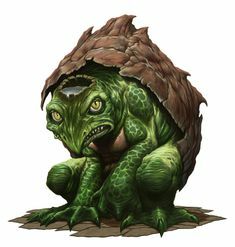 Descrption: A mystic creature that resembles an overgrown bipedal turtle. When attacking, it uses it's sharp claws that can deal large cuts (D Ranked Slashing Damage) to its enemies. It often gets inside it's shell to defend itself which would be able to protect itself from a B-Ranked skill, 2 C-Ranked Skills, 4 D Ranked skills or 8 D Ranked skills. Taking this once my previous quest is approved.